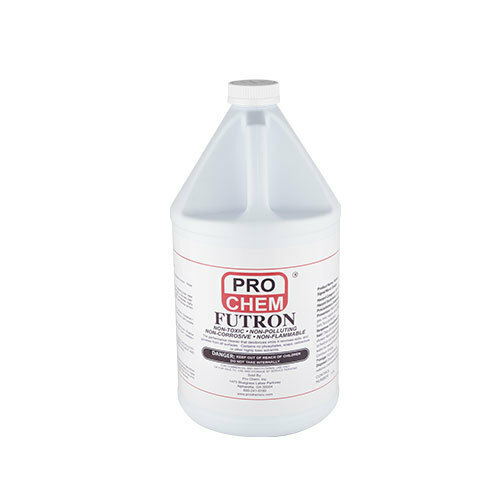 FUTRON | Pro Chem, Inc.
FUTRON is a concentrated, butoxyethanol-free cleaner and degreaser, which effectively removes greasy soils from a variety of surfaces. Works by emulsifying and suspending greases, oils, soils and all undesirable matter. This product is environmentally appealing because it contains no soaps, phosphates, highly toxic solvents or non-biodegradable detergents. Recommended for use where water-soluble solvent cleaners cannot be used and where greasy, oily soils exist. It is intended for use as a general cleaning agent on all surfaces, or for use with steam or mechanical cleaning devices in all departments of official establishments operating under the Federal meat, poultry, shell egg grading and egg products inspection programs where there is no possibility of food contact in food processing and food handling establishments. This product works well in hot or cold water and hard or soft water. FUTRON is extremely versatile and can be used in automatic cleaners, steam cleaning machines, pressure washers and any mechanical spraying device. Routine maintenance: Dilute 1 part FUTRON with 100 parts water. Light cleaning: Dilute 1 part FUTRON with up to 50 parts water. General cleaning: Dilute 1 part FUTRON to 25 parts water. Heavily soiled surfaces: Dilute 1 part FUTRON to 10 parts water. Avoid use on aluminum or glass. Do not use undiluted.